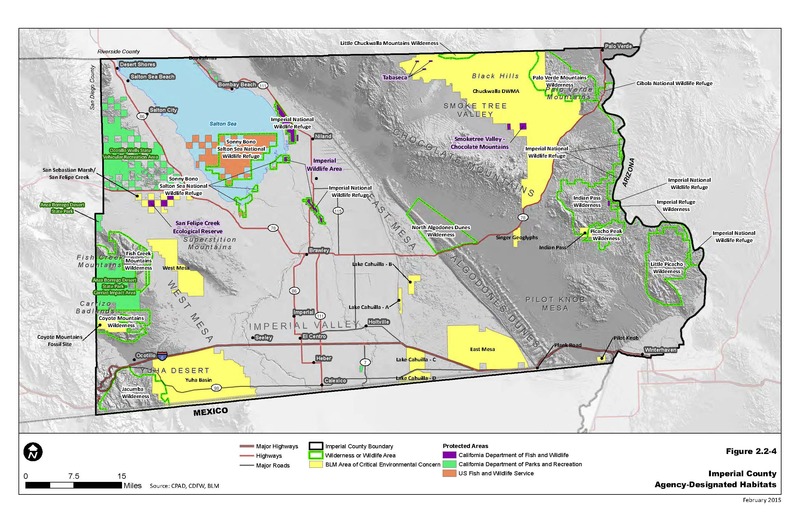 The County of Imperial was the recipient of a California Energy Commission Grant on July 15, 2013, to update the existing “Geothermal/Alternative Energy & Transmission Element” of the General Plan. Other objectives include the creation of an inventory of baseline information, identify eligible renewable energy resource opportunities, review State and Federal legislation and policies, review other elements of the General Plan for internal consistency, develop an outreach program, prepare a revised ordinance and renewable energy overlay zone, and prepare the required environmental document. Aspen will prepare a Baseline Environmental Inventory Report. This report, which will make use of technical memorandums and GIS data from the existing studies being completed under the Geothermal/Alternative Energy Element Update, the DRECP, and other sources as appropriate, and will focus on the issues addressed in the Conservation and Open Space Element. These studies will also be used as the basis for the environmental document. GIS mapping for each resource area will be updated using County-provided GIS base layers and existing data sets. Regional Aesthetics: Evaluate existing scenic vistas and visual character within the County. The work will be compiled in narrative and map format. Biological Resources: Identify sensitive species, habitats, and resource conservation plan areas within the County. Sensitive areas will be identified and mapped as appropriate. Cultural Resources: Identify known locations of sensitive cultural and historical resources within the County. Sensitive areas will be identified and mapped as appropriate using data provided by the County. Geology and Soils: Update existing data in the soils section of the 1993 Conservation and Open Space element and add geology information that is appropriate. Mineral Resources: Update information on mineral resources and mineral resource extraction activities. 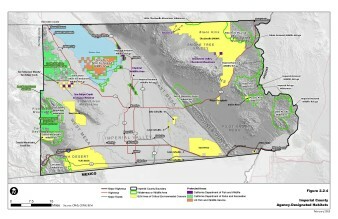 Historically, a wide variety of mineral resources have been found in Imperial County. These include gold, gypsum, sand, gravel, lime, clay, and stone of high economic value. This section will update the baseline information on activities from 1993 to present day for mineral resources in the region. Open Space/Recreation: Identify regional open space resources and recreational areas, including trails, parks, OHV areas, campgrounds, and wilderness areas.